Smith & Cult is more than a nail polish, it's a work of art. When I first gazed upon the beautiful shades of blues, pinks, and metallics, I couldn't help but wonder how I would display these miniature art pieces on my vanity. Move over perfume bottles! There's a new beauty item so stunning, it needs to be shown off. I was invited to attend a fabulous breakfast at the Fontainebleau Miami on Saturday, and it was there that I was introduced to Smith & Cult. After one glance we were in lust. So who created this funky new line dubbed, "the next evolution in beauty?" None other than Dineh Mohajer and Jeanne Chavez---the women behind the successful brand Hard Candy that was acquired by LVMH in 1999. It's no wonder you'll find fun glitter elements in the new nail varnishes that will instantly take you back to the '90s when no girl could live without her sparkly Hard Candy eye liners. 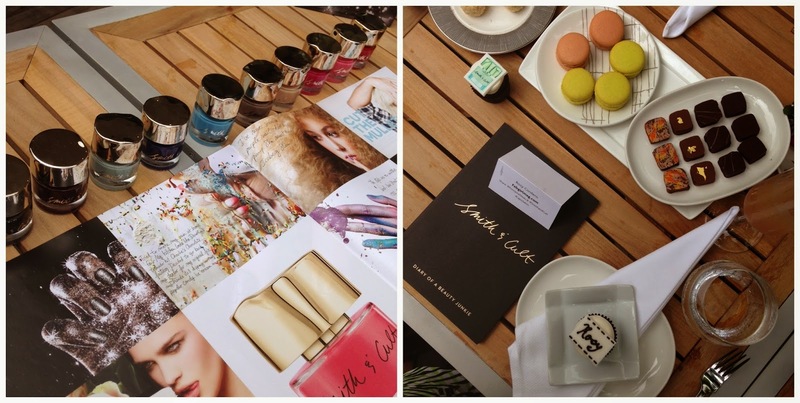 After reading the brand catalog that is made to look like a diary, we headed to Lapis Spa where we were treated to manicures and pedicures using our favorite shades of Smith & Cult. I'm writing this four days later and I have yet to see a chip on my mani or my pedi. WINNER!